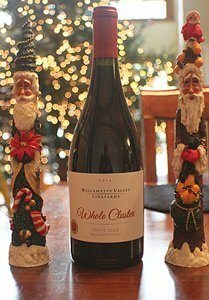 We had both the Willamette Valley Whole Cluster Pinot Noir and the Wente Chardonnay at our tasting. Holiday parties are a great time to taste some wines that might be new to you. A good way to remember those wines is to take a photo of the label with your smart phone. Then you can take the photo to your favorite wine shop and they will either find that wine or a similar one. I came across an old favorite at a holiday gathering for Communities in Schools, a wonderful non-profit organization that works with the school system to keep children in school and working toward a diploma. They do all kinds of things from mentoring, to tutoring to helping families during times of need. 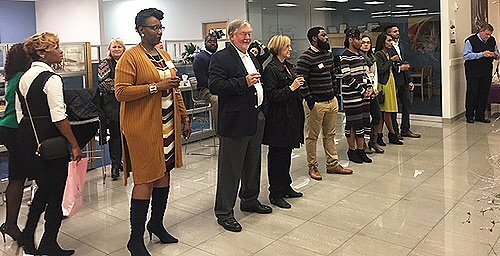 The Augusta Mercedes-Benz dealership hosted the gathering, so we had a great venue. CIS showed a video about some of the situations where CIS was able to make a big difference. While watching the video and talking about CIS we sipped six wines. 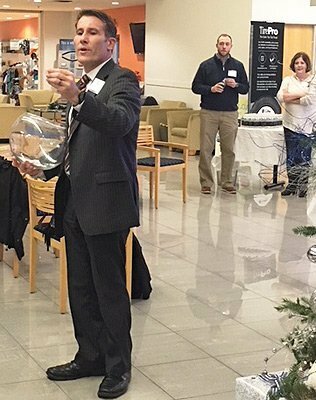 CIS board member Joe Adams draws a name to win one of several gift bags provided by Mercedes-Benz. They all were good, but my favorite of the night was the Willamette Valley Vineyards Whole Cluster Pinot Noir. It is a bright, refreshing wine, perfect for holiday gatherings as well as special meals. The wine is a deep ruby color in the glass, with inviting aromas of blackberry, cherry and baking spices. It has a lush mouthfeel with flavors of strawberry and raspberry. Bright acidity keeps the wine well-rounded and a nice match for food. The finish is long and smooth. It should continue to develop in the bottle for another 3-4 years, but it is outstanding right now. 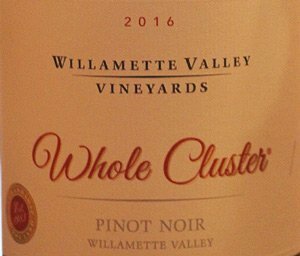 Willamette Valley Vineyards produces several beautiful pinot noirs, but the combination of price and flavor makes this one of my favorites. The wine is made from six different clones, adding some complexity. The whole berry fermenting process also is an interesting twist on traditional wine making. Instead of destemming and crushing the berries, the winemaker drops clusters in a chilled fermenter. He then pushes out all the oxygen with carbon dioxide and seals the vessel. The berries swell up and turn pink, releasing a lovely aromatic pinot noir when they burst. Fermentation continues for 7-10 days in the tanks. The result is a fruit forward pinot that still shows some restraint, much like pinots from Burgundy. We served the wine at a cool room temperature, but it is even better if you chill it slightly, treating it almost like a white wine. Winery: Oregon native Jim Bernau purchased the land for Willamette Valley Vineyards in 1983 and then began clearing blackberry vines and the remnants of a plum orchard. He planted pinot noir, chardonnay and pinot gris vines. When he started he hand watered the vines with thousands of feet of hose. Brenau sharpened his winemaking skills by taking classes at University of California-Davis and attended seminars on the west coast and in France. Part of the tasting room at Willamette Valley Vineyards. Finally, in 1989 he was ready to build his winery and craft world-class wines. He specializes in cool climate varietals, especially pinot noir. The company has added to its estate vineyards over the years until now it owns nearly 500 planted acres. Through sales of stock the winery now has more than 9,000 owners. The winery’s philosophy is to do as much of the work as possible by hand. Willamette Valley Vineyards practices environmentally sustainable farming, and even offers a 10-cent bottle deposit if you return an empty bottle to the winery. The winery produces several pinot noirs, including the Estate ($32), Elton ($55), Bernau Block ($65), Tualatin ($44), Hannah ($55) and Whole Cluster. Other reds include a tempranillo ($45), cabernet sauvignon ($45), grenache ($45), syrah ($45), merlot ($40), cabernet franc ($40) and a port-style pinot ($50). It also makes a wonderful pinot gris ($17), Estate Chardonnay ($30), pinot blanc ($24), viognier ($30), sparkling muscat ($19), a riesling ($14) and a pinot noir rosé ($24). 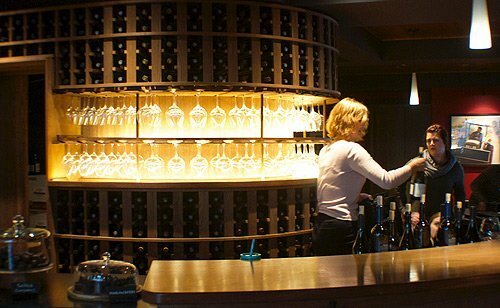 The winery has a modern tasting room that offers tasting flights, pairing menus, wine dinners and tours. It is located in Turner, south of Portland. I visited with some friends a year ago, and enjoyed the views and the food at a great lunch. Waiting for lucky names to be drawn. Goes with: While at the Communities in Schools reception, I had this delightful pinot with shrimp cocktail and other finger foods. It is a very nice wine for all kinds of light foods. I also have enjoyed this wine with pulled pork. The fruit flavors of the wine mix nicely with the smokey pork and barbecue sauce. It also would pair well with roast duck, salmon, grilled chicken, veal parmesan, sushi, pizza and spicy Asian dishes. The winery has a recipe on its website for barbecue sauce to put on pork ribs. It sounds so delicious I am including that recipe and hope to try it soon. 4 Tbsp. seasoning, salt, pepper and dried herbs. In a large pot over medium-high heat, sauté the onions and garlic until the onions begin to caramelize. Add all the dried spices, sugar and peppers, cooking for five minutes. Stir constantly to prevent scorching. Next, pour in the pinot noir, vinegar, ketchup and blackberries. Reduce heat to medium low and continue to simmer for 15 minutes. Blend sauce completely with an immersion blender. Simmer for another 15 minutes on low heat. Let cool. Clean the silver skin from the ribs to allow for better absorption of the sauce and seasonings. Evenly sprinkle ribs with the spice seasoning. Then baste with the sauce, applying a heavy coat. Bake ribs at 250 degrees for four hours, basting every hour. Finish by placing the racks of ribs on a hot grill to achieve light charring. You could cook the ribs on a grill at 250 degrees or less, but then I wouldn’t apply the sauce until near the end. You also could use Morton Nature’s Seasons for the spice seasoning to sprinkle on the ribs.